Golf isn’t just for the big kids! Portland has an array of fun, family-friendly miniature golf courses that are perfect for getting the kids out from in front of their video games and invested in a more active form of gaming! Whether you are looking for a smaller version of the real thing, or something a bit more creative—like…let’s say a glow-in-the-dark course— we’ve found the best local spots for practicing your swing and yell, “fore!” Read on to find out where we think you and your wee ones should head the next time you want to play golf! You don’t have to be a serious golfer to swing your clubs with the pros. This course makes even the tiniest of athletes feel like they have a camera-ready game. With scaled-down version of 18 world famous golf holes, this location has water hazards, sand bunkers, and 3 acres of forested beauty to enjoy all day long. 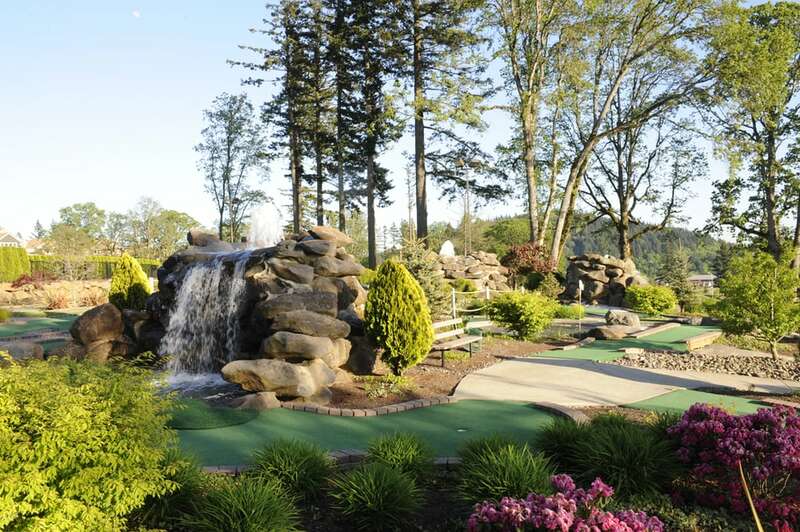 Tualatin Miniature Golf Course also offers reduced group rates for 8 or more people, as well as a Birthday Party Package that includes Mini Golf, meals and drinks, and a private room for up to 2 hours. Everybody knows that Oaks Amusement Park is the place to go for great rides and roller skating, but their Chipper’s Woods Miniature Golf Course is should not be overlooked. This newer addition to the amusement park, has 18 super-fun holes on a rolling terrain with exciting obstacles to maneuver through. Shaded by beautiful big oak trees, with a gorgeous view of the Willamette River, it is a popular destination during the warm summer months. Of course, a trip to Oaks Park with your littles may involve more than just a round of mini-golf, but the park offers lots of package options to meet your price point. Hours: Vary daily, visit calendar for up-to-date info. If you are looking for a scenic mini-golf experience Eagle Landing is your place to go. It’s 36-hole challenge winds through trees, waterfalls, fountains, and mountains keeping the game interesting and pleasing to the eye. While getting out your clubs is the perfect summer activity, this location stays open during the day all year long and then extends into the evening during the warm months. If you are planning your game at night, remember: last call for mini golf is 9:30 pm. Located in the beautiful SE Montavilla neighborhood, this course is a unique “must experience” for the professional mini-golfer. Twin Pines Country Club is a homemade, free mini golf course set up by Olivier and Donna. That’s right – it’s free! They don’t even accept donations.This Portlandy duo decided to donate their time and resources to the community by building a miniature golf course in their large, grassy side yard, and leaving it open for everyone to use! It’s small and simple, with brick-lined AstroTurf to define the course, a number of eclectic statues and obstacles (including the quintessential windmill) to provide the appropriate level of fun and challenge, and of course two signature pine trees to provide shade and a requisite “nature” hole. This is truly a family-friendly course for all ages—if your little one can walk, then they can play! The family even provides clubs and balls in a locker on-site. They only ask that you keep your groups small, and respect the neighbors and residential parking restrictions. Whether you are trying to escape the heat or rain, Glowing Greens Blacklight Miniature Golf is ideal. Located in Portland and Beaverton, this mini-golf option offers black light 3-D adventures that are sure to entertain kids of all ages. The Portland location is downtown, underneath the Hilton Executive Tower, and features a glowing pirate-themed 18-hole course, including skeletons, mermaids, creepy forests, and of course troves of pirate treasure! The Beaverton location, also an 18-hole course, is alien-themed, with scenery and figures that are out of this world! The average game lasts about 45 minutes and groups and individuals are accomodated. Hours: Sun.-Thurs., noon-9 p.m; Fri.-Sat., noon-11 p.m.
For indoor fun on the east side, check out the Tiki Putt Family Fun Center in Gresham. Their 18-hole mini golf course is Hawaiian-themed, black lighted, and full of beautiful artwork and interesting features, including a spinning active volcano hole! With a huge play structure and arcade as well, it is a great place to bring kids of all ages. There is also a café onsite, with reasonably priced snacks and drinks. Do you have a favorite golf course? share it with us in the comments below.